Strawberries and Cream Pops are a healthy and yummy sweet treat perfect for the hot days! Extra smooth Aussie-style yogurt combined with pureed strawberries creates the perfect simple sweet treat! 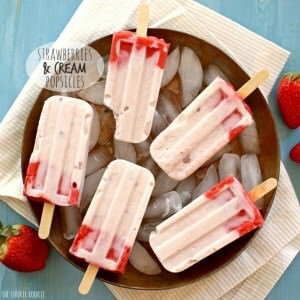 Both kids and adults love Strawberries and Cream Pops! I know it’s still winter, but there is always time to enjoy a creamy, healthy, delicious popsicle!! Now that I’m home more, I’m hoping I can babysit my niece Desdi more often. (Desdi is also about to become a big sister to a baby BOY in February and I CANNOT WAIT) She is like any typical 2 1/2 year old; full of sass, smart as her Aunt Becky, and usually a picky eater! When she is at my house, I have to have fun and easy treats for her to enjoy, and I don’t want to be the Aunt that only feeds her McDonalds french fries!! 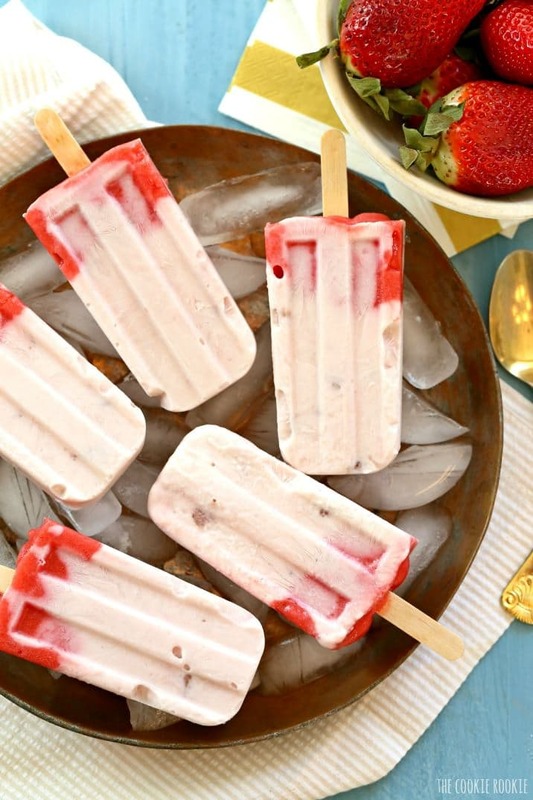 Healthy Strawberries and Cream Pops to the rescue! 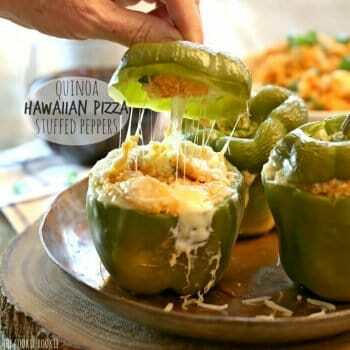 Light, delicious, and fun, I think these will be a hit with us both. 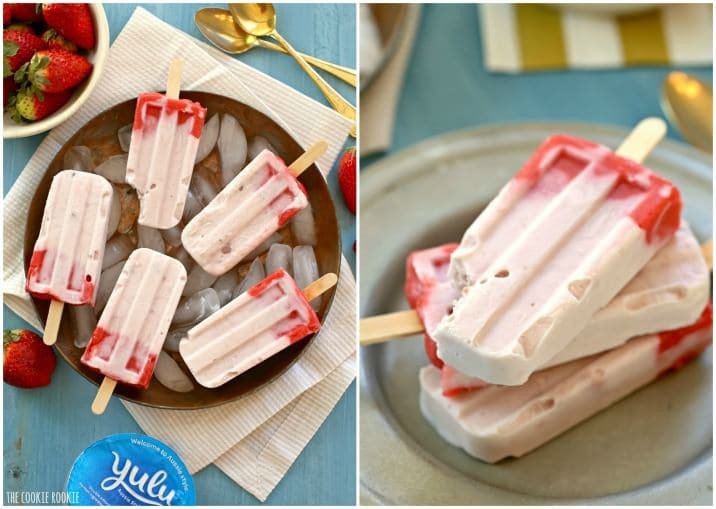 I’m so excited about these pops because I made them with a BRAND NEW yogurt that is just hitting the shelves (perk of the new job!). 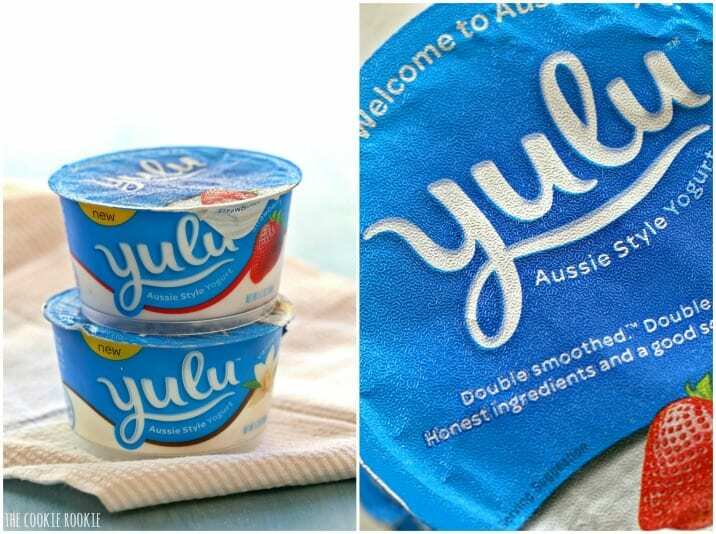 Yulu is a new Aussie Style, DOUBLE CREAMED yogurt made in the USA. It’s a taste you just have to try. 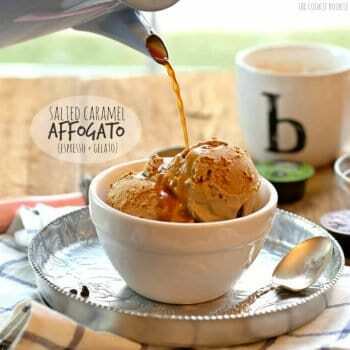 It doesn’t have the sometimes sour/tangy taste of greek, its smooth from the first spoonful. I was really impressed, and it’s perfect for frozen yogurt pops. I love that the packaging is see-thru. I want to see what I’m purchasing. It’s unique and modern, I think you and Desdi are going to love it! To make the base of the pops, I just pureed frozen strawberry slices that already had sugar added. You can totally leave the sugar out. I think it adds a nice sweetness, but it’s healthier and just as delicious with simple pureed sliced strawberries! 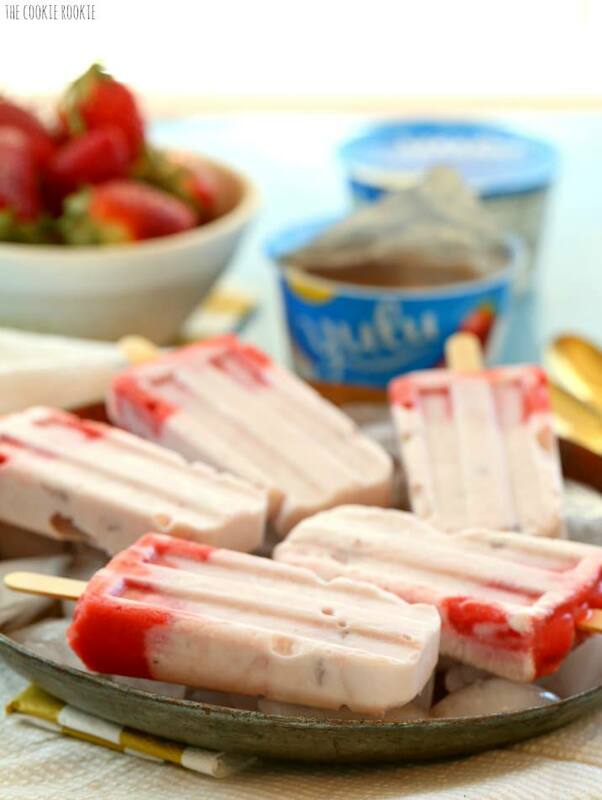 Just add your Strawberry Yulu, top with pureed fruit, and freeze! 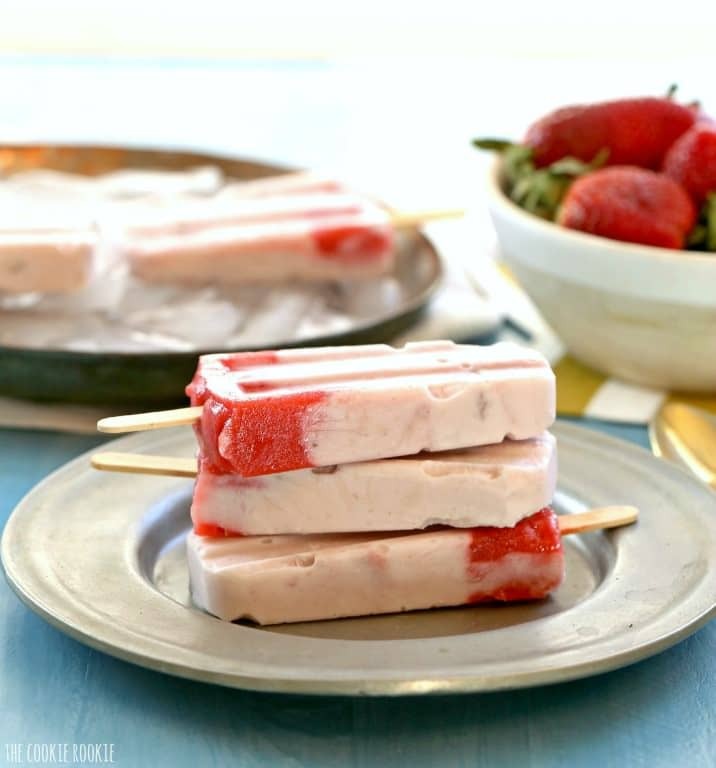 You’ll be on your way to creamy delicious Strawberries and Cream Pops in no time! Click HERE to find out more about Yulu and where you can purchase. Let me know which flavor you like best! Enjoy! Place strawberry slices in a blender or food processor and blend until pureed. If you're using frozen strawberries, the end result will look like a sorbet. 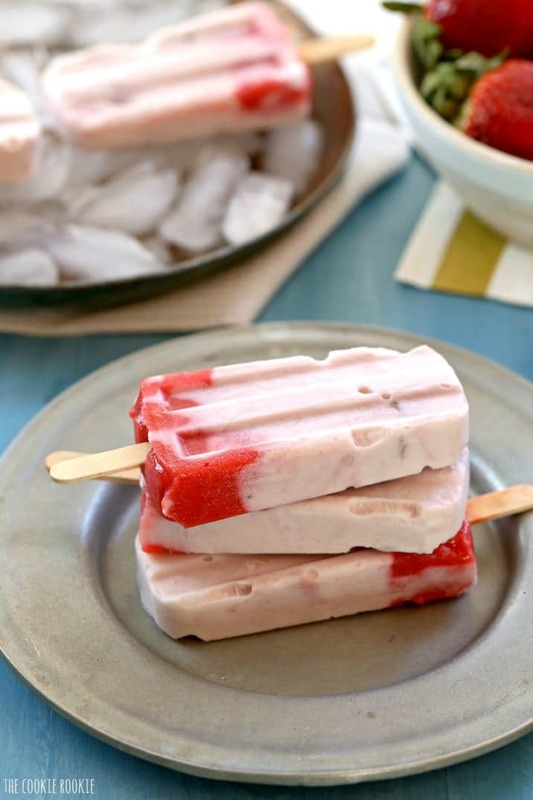 Fill your popsicle molds 3/4 full with yogurt. Top each mold with the puree mixture. I eat ice cream all year round so I say bring on the popsicles!! These look fantastic! 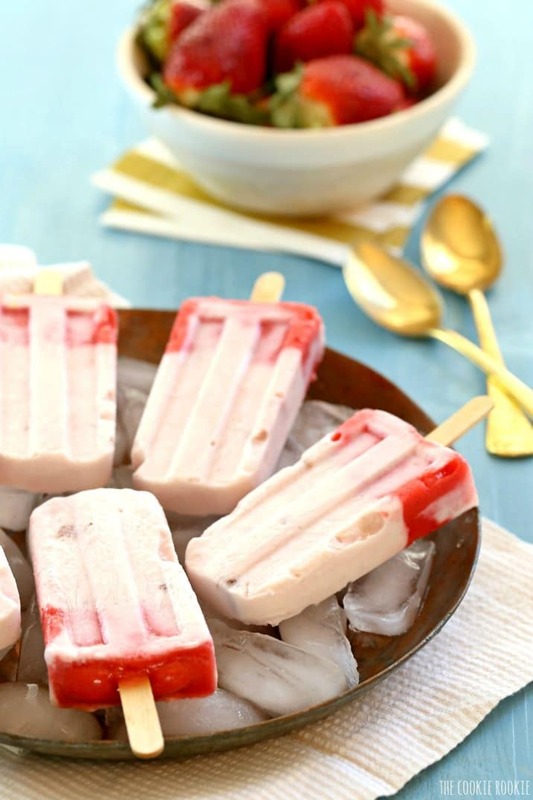 I love how easy these strawberries and cream ice pops are to make.. and how healthy they are too!